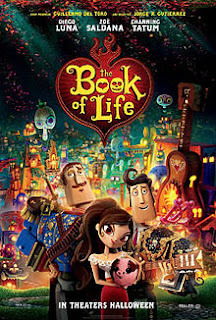 Considering how much of the population in America are Mexican these days, I'm surprised it took so long for a movie like “The Book of Life” to get made. You can thank producer Guillermo del Toro for that, as the screenplay for this film got bounced around Hollywood for years until he promised to attach his name to it. I feel he has done the world a favor by doing this. Not because I'm an advocate that there's needs to be more ethnic diversity in animated films (if the movie is good I really don't care what the characters skin color is), but because this is the sort of unique movie going experience families don't normally get when they pay money to go to the theaters. Besides, a little culture never hurt anyone. A lot of American's already celebrate Cinco de Miyo, so having a movie that celebrates the Day of the Dead seems like a logic second step. What's also nice is that this is not a film that attempts to Americanize Mexican culture or make an attempt to tear down the culture barriors. No, this is a film that celebrates them, crafting a wildly inventive story around a countries unique beliefs and customs. 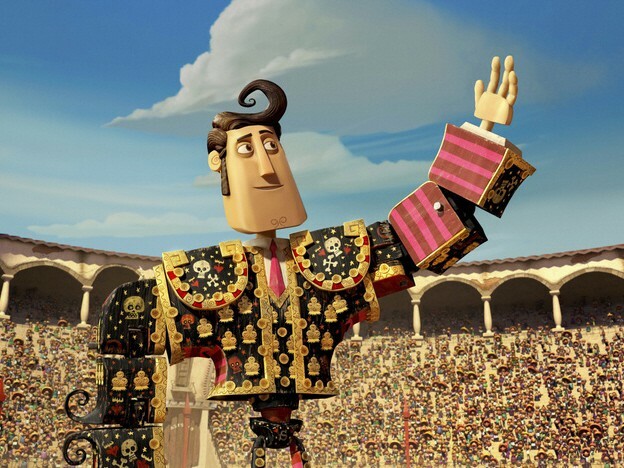 What's more, “The Book of Life” features colorful and eccentric characters that are instantly memorable and easy to like. Even the bad guy is sympathetic, as his ultimate goal is not to rule over the world or kill anyone; he just wants to live in a less dreary place. He rules the Land of the Forgotten, where dead souls who are forgotten go when there is no one left who remembers them and they simply cease to exist. 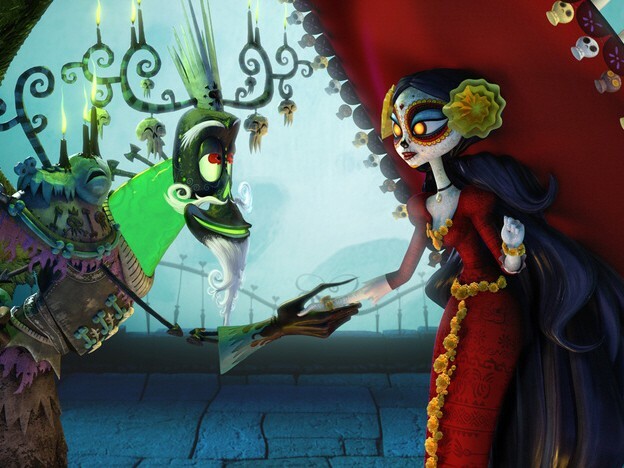 His girlfriend, La Muerte (Kate del Castillo), rules the Land of the Remembered, where souls who are remembered live to party in some of the most colorful animation I've ever seen. These two are dating but La Muerte isn't keen on the whole timeshare idea Xibalba (Ron Perlman) would like to implement. So they make a deal: There are three friends, two boys and one girl, and both the boys love the girl. They make bets on which of the boys the girl will eventually fall in love with. They don't discuss the possibility that she might not fall in love with either of them, so I guess in that situation it's considered a draw. Maybe they could swap ruling worlds every few months in that case? Never mind. The movie follows these three characters who are all Mexican yet have ethnically different voices actors. Diego Luna as the main protagonist is Mexican born, however Channing Tatum and Zoe Saldana are about as far from Latino as you can get. Zoe Saldana particularly stands out as being the most ethnic neutral actor working today. She plays people who are black, blue, green, and now Latino, and she plays them all with ease and a charm that is infectious regardless of the characters personality. Again though, this should all really be beside the point, as good movies are good movies. 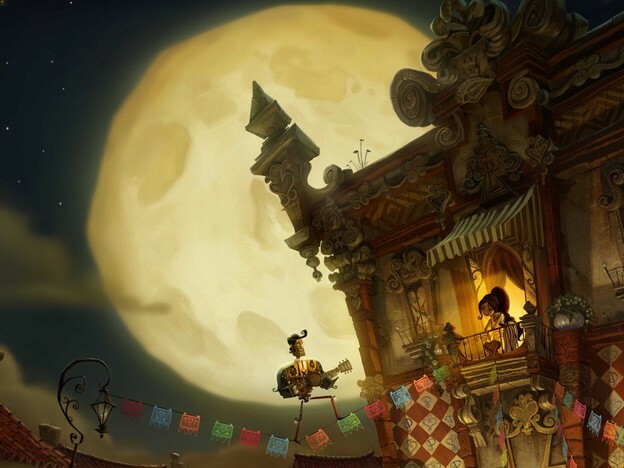 I haven't discussed much of the story in “The Book of Life” because I feel the beginning is so by-the-numbers that I would be doing you readers a disservice to discuss the parts of the story that get really good. Besides, most of the fun isn't from the story itself, but through the lively characters, beautiful animation, and 3D effects that prove the format is still capable of enhancing movies when used properly. It's a fun movies for families of all ages, size, and country of origin. Despite how this review reads, don't walk into “The Book of Life” as a human rights event, but as a fun movie that you can enjoy with everyone you know. Oh, and on a final note I'm sure there are those out there who are not going to get why the characters look blocky, with stringed beads for fingers and heads that look like they could be detached at a moment's notice. It took me a moment to figure out why everything looked this way, and then it dawned on me that the characters look like toys that Mexican children typically play with. They might not have a wealth of electronics at their disposal, but I'll be darned if they don't make inventive toys with their limited amount of resources. Parents, there are images of death, but the film remains surprisingly cheerful. Recommended for ages 7 and up.